Jim Ottaway expresses his creativity by connecting things: the night sky, synthesizer technology, a positive musical standpoint... Using the concept of The Cosmos to search his own inner depths, Ottaway understands that something singular may spark multiple themes. With his eyes on the constellations of the Southern Hemisphere he gives us Southern Cross (69'39"), a gorgeous album of six atmospheric mood pieces. It is a captivating, often glorious listening experience. Fully and effectively imagined, these works each open a warm and beautiful space, then move slowly through it - taking time to take in its surroundings. Reminding us of a realm much larger than ourselves, Ottaway's hope is for the listener to come away from this spacey aural encounter with a better connection to The Universe. Music and sounds drift in from nowhere, establish themselves, and then fade away without warning. As if in some amazing, converging, coincidence of sounds, we are pushed towards the center of this sonic universe. Synthetic textures meld together to form compositions which feel transcendent, yet tethered to The Earth. Throughout Southern Cross harmony and timbre mutually reinforce each other. Faint chimes cast above luminescent chords provide a slow contemplative pace, while reverberant strings shift from dark keys to light. The experience is quiet and beautiful. Most times consoling, but occasionally questioning, Southern Cross is a subtle journey into beautiful musical and interstellar planes. The grandeur of consonant harmonies is grounded in the detailed and imaginative electronic modulations just beneath the aural glow surrounding each track. The result is beautifully flowing and transporting music - contemplative for the mind, while warming to the heart. 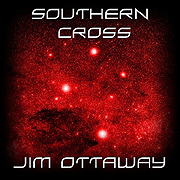 This frontier will never close - so long as artists like Jim Ottaway are out there working, exploring and expanding the Spacemusic genre at such an advanced level.